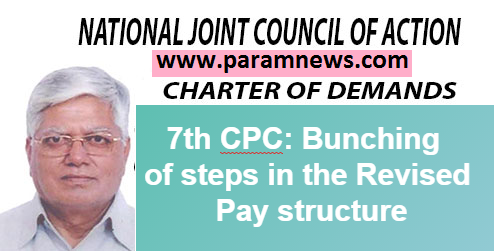 Bunching of steps in the Revised Pay structure is important items for inclusion in the agenda for the National Anomaly Committee meeting based on 7th CPC Anomaly. Although the rationalisation has been done with utmost care to ensure minimum bunching at most levels, however if situation does arise whenever more than two stages are bunched together, one additional increment equal to 3 percent may be given for every two stages bunched, and pay fixed in the subsequent cell in the pay matrix”. i) Benefit on account of bunching is to be extended when two or more stages get bunched. (ii) Benefit of one increment is to be extended on account of bunching of every two consecutive stages. (iii) As stipulated in MoF OM dated 07 09.2016, a difference of 3% to be reckoned for determination of consecutive pay stages, specific to each employee. (iv) All pay stages lower than the Entry pay in the 6th CPC pay structure indicated in the pay Matrix contained in the 7th cpc Report are not to be taken into account for determining the extent of bunching.